The last day I get to spend with my kiddos and the last day before I can regain my sanity, lol. I'll miss having them around, but at least I won't be listening to all the whining and tattles of each other. I also have a new job that I really get to get lost in more so when they return to school. 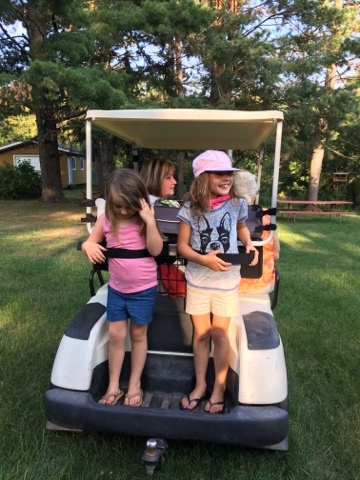 Safety first on golf cart rides. So I think we are back in business of writing!?!? We moved and had no computer for the longest of time, the. I got everything going, and said computer took a crap I blame old cables. Anyways never found the time to get them replaced just kept living day to day with what was needed to be done. Then one day I got the blogger app and it was pointless. I mean it let me write post and that was about it. I couldn't upload any pictures. Let's face it, if you know me I love my pictures. So months had passed and yesterday I had decided to re download the blogger app. Presto! Now here we are. 😊 so I can't wait to start writing all over again.